For years, Twitterrific for iOS and macOS were developed side-by-side, each matching the other feature for feature. But around 2013, development of the macOS version of Twitterrific slowed, while the iOS version continued to push forward with innovative features like Center Stage, the app’s media browser. Sticking with Twitterrific for macOS meant forgoing features supported by competing Twitter clients and Twitterrific’s iOS version. 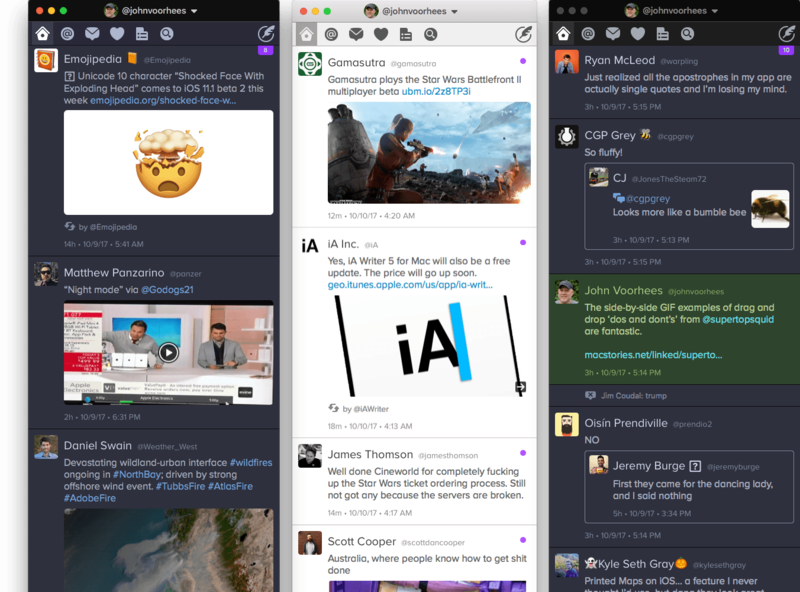 With the relaunch of Twitterrific for macOS today, The Iconfactory has begun to change that. Funded by Kickstarter and codenamed Project Phoenix, the relaunched app is a solid 1.0 release that brings Twitterrific as close to parity with its iOS sibling as the two apps have been in years. There are still features that the iOS version of Twitterrific has that the macOS version doesn’t and that I’d like to see added, but for many people who move between Mac and iOS devices each day, today’s release makes Twitterrific a viable option for the first time in a while. All the basics you’d expect to find in a Twitter client are here. You can tweet, reply, send direct messages, read your timeline, mark tweets as favorites, search, and view lists. That’s all core functionality that works well, but it isn’t what sets Twitterrific apart. One of the cornerstones of Twitterrific on iOS is its user interface. As with the iOS version, The Iconfactory has given users a high degree of control over how Twitterrific looks within a clean, easy-to-read design. You can pick between light and dark themes and tweak the typography, text size, and the way media is displayed. Tweets are subtly color-coded too, distinguishing your tweets and mentions at a glance. Twitterrific's UI is highly customizable. There are several other UI touches I like in Twitterrific. 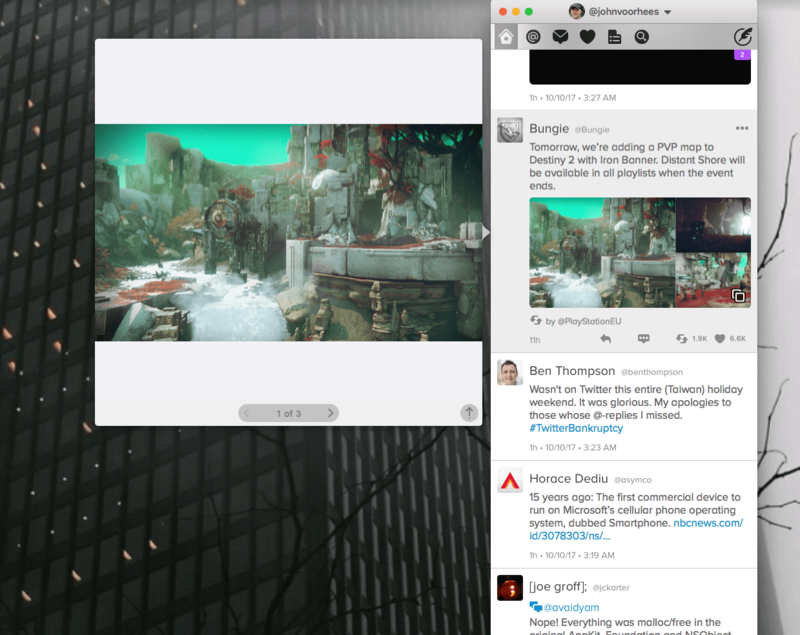 For example, you can also open multiple windows to monitor your timeline and replies side-by-side or view multiple accounts at once, for example. I also appreciate that details about a tweet, like the number of times it’s been marked as a favorite and the number of retweets, are all at my fingertips, along with the ability to view media and threads, quote a tweet, reply, or share it. As someone who spends my day jumping between iOS and macOS though, timeline syncing is one of Twitterrific’s most important features. In Preferences, you can set Twitterrific to sync via iCloud or Tweet Marker and ‘Show and Scroll to Marker,’ ‘Show Marker,’ or ‘Scroll to Marker.’ In my tests, syncing was rock solid, keeping all my devices at the same point in my timeline so I can pick up where I left off regardless of the device I’m using. Twitterrific has also embraced system-level features like the share sheet. Behind the three dot button in the top righthand corner of each tweet, you’ll find ‘Copy Link,’ ‘Copy Text,’ ‘Open in Browser,’ and ‘Translate,’ plus access to the system share sheet, which makes it easy to send tweets to Notes, other social media services, and other apps you have installed. Notification Center, Retina displays, and Voice Over are all supported too. Still, not every feature of the iOS version of Twitterrific or other Twitter clients is here. In fairness to The Iconfactory, it’s worth keeping in mind that this version of Twitterrific for macOS is a ground-up rewrite of its macOS client. As a version 1.0 product, Twitterrific is a solid foundation, on which I expect The Iconfactory will continue to build. However, depending on how you use Twitter, you may be disappointed by some of what it doesn’t do. For example, you cannot save draft tweets, the muffles (Twitterrific's version of mute filters) you create on iOS are synced to the macOS version, but you can’t create new muffles on your Mac, you can view lists, but there’s no way to manage them, you cannot edit your profile, and there are no location services. To be fair, some of the omissions I’ve listed are things that The Iconfactory clearly communicated they would not be doing if the Kickstarter campaign didn’t reach $125,000, which it didn’t, but they are worth noting because they may be dealbreakers for some users. Personally, I can live without most of the features listed above, except perhaps the inability to create Twitterrific’s version of mute filters called muffles. Muffles help me keep the fire-hose of information that Twitter throws at me under control so I can keep up. The absence of muffles on macOS is mitigated by the fact that filters created on iOS are synced to macOS, but as someone who moves between both platforms all day, I want the ability to create and manage muffles in both places. The importance of muffles is specific to how I use Twitter and won’t apply to everyone, but it highlights the difficulties The Iconfactory faces relaunching a Twitter client in 2017. There isn’t one correct way to use Twitter. Two users can have very different sets of features that they view as critical to how they use the service. You may not care about muffles at all but can’t live without the ability to manage lists for example. It’s hard to serve all of those users with one product. Twitterrific for macOS is available on the Mac App Store.